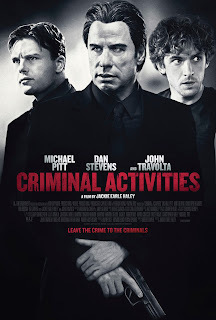 John Travolta stars with young talented actors Michael Pitt, Dan Stevens, Christopher Abbott and Rob Brown in the dark comedic crime thriller “Criminal Activities” where a group of friends gets accidentally involved with a mobster's shady business after borrowing money. When four young guys who reunite at an ex-classmate's funeral, one mentions to the others inside information on a stock that is a guaranteed lock to make them instant millionaires. Unfortunately, the deal goes south along with their investment. Things go from bad to worse: one of them borrowed his share of the money from a mobster. Returning in full baddie form, John Travolta plays the crime kingpin they're indebted to, and these amateur criminals find themselves trying to outwit the crime’s ruthless path in settling the debt. Directing “Criminal Activities” is long time multi-talented actor Jackie Earle Haley and Oscar nominee whose notable works in “Bad News Bears,” “Little Children,” “Dark Shadows,” “Shutter Island” and “Watchmen” marks his directorial debut in the movie. Haley said that his decades-long career as an actor prepared him for working with his cast, which along with Travolta includes "Boardwalk Empire" actor Michael Pitt, "Downton Abbey" heartthrob Dan Stevens and Haley himself as one of Travolta's threatening associates. “I think having been an actor for so long, actors themselves place a little more trust in a director who is also an actor because they know that you know what they’re going through," Haley explained. "Everybody has a little bit of a different process, and it’s good to figure out how to deal and work with those different idiosyncrasies, so there is that. The film's screenplay by Robert Lowell, a compelling and dialogue-heavy thriller that recalls the post-"Pulp Fiction" (1994) boom of such works in the mid-'90s, came to Haley through producer Wayne Rice, who is also Haley's manager's husband. From acting and writing to a first-time director, Jackie Earle Haley proves to be a triple threat after taking the script to the big screen for the most enjoyable cinematic experience this year. Criminal Activities squashes all average-joe crime movies with its mind-blowing plot twist and superior talent. “Criminal Activities” will open this January 20 in cinemas from OctoArts Films International.